WAKEFIELD, Mass. 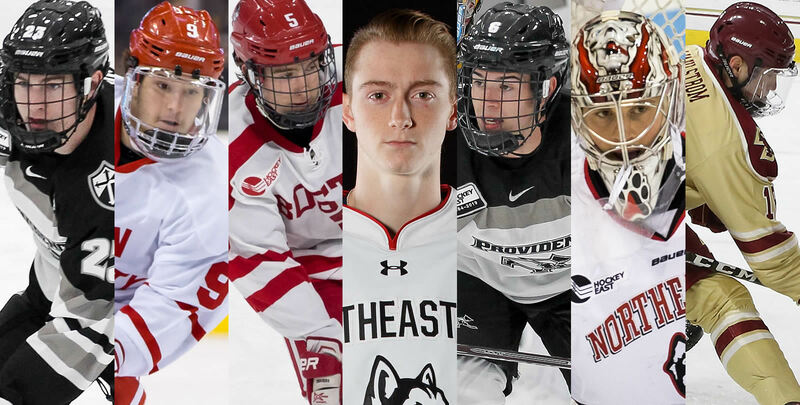 - Seven players currently competing in Hockey East have been selected to the preliminary roster of the 2019 U.S. National Junior Team, including two each from Boston University, Northeastern and Providence and one from Boston College. Additionally, Northeastern associate head coach Jerry Keefe (Saugus, Mass.) will serve as an assistant coach for Team USA. Those representing Hockey East include goaltender Cayden Primeau (Voorhees, N.J./Northeastern), defenseman Michael Callahan (Franklin, Mass./Providence), and forwards Logan Cockerill (Brighton, Mich./Boston University), Joel Farabee (Cicero, N.Y./Boston University), Tyler Madden (Deerfield Beach, Fla./Northeastern), Jay O'Brien (Hingham, Mass./Providence), and Oliver Wahlstrom (Quincy, Mass./Boston College). Additionally, Boston University defenseman Cam Crotty (Greely, Ont.) and forward Shane Bowers (Halifax, N.S.) were named to Hockey Canada's preliminary roster for the tournament, while UConn forward Jachym Kondelik (Budějovice, Czech Republic) and Massachusetts goaltender Filip Lindberg (Espoo, Finland) were also invited to their home countries' training camps. The U.S. National Junior Team will take part in the 2019 International Ice Hockey Federation World Junior Championship Dec. 26, 2018 – Jan. 5, 2019, in Vancouver and Victoria, British Columbia. Training camp is set to take place Dec. 15-22 in Everett, Washington and Kamloops, British Columbia and includes exhibition contests against Russia and the Czech Republic. Serving as head coach for Team USA is Mike Hastings (Crookston, Minn./Minnesota State), head coach of Minnesota State men's ice hockey team. He will be joined behind the U.S. bench by assistant coaches David Lassonde (Durham, N.H./Dartmouth College), Steve Miller (Columbus, Ohio/Ohio State University), Scott Sandelin (Hibbing, Minn./University of Minnesota Duluth) and Keefe. Callahan is in the midst of his first season with the Friars and has recorded three points in Hockey East play, (1g, 2a) and five points overall (1g, 4a). A 2017-18 USHL All-Rookie team selection, Callahan was selected by the Arizona Coyotes in the fifth round (142nd overall) in the 2018 NHL En try Draft. Cockerill has recorded five points (2g, 3a) through 13 games of his second season as a Terrier after a 20-point rookie campaign (8g, 12a). The Brighton, Michigan native helped Team USA capture the gold medal at the 2017 IIHF Under-18 World Championship, as well as gold medals at the 2016 and 2017 U18 Five Nations Tournaments. Cockerill was selected in the seventh round (201st overall) of the 2017 NHL Entry Draft by the New York Islanders. Farabee is currently tied for fifth for rookie scoring in Hockey East p lay with six points on two goals and four assists, and also ranks first in shots on goal with 30 shots through 10 conference contests. Farabee captained the 2017-18 U.S. National Under-18 Team, helping lead Team USA to a goal medal at the 2017 IIHF Under-18 World Champion - ship and a silver medal in the 2018 IIHF Under-18 World Championship. The Cicero, New York native was selected in the first round (14th overall) of the 2018 NHL Entry Draft by the Philadelphia Flyers. Madden was selected in the third round (68th overall) of the 2018 NHL Entry Draft by the Vancouver Canucks. The rookie has recorded 11 points (5g, 6a) through his first 13 contests with the Huskies. His six points (1g, 5a) in Hockey East play rank tied for fifth among all freshman. He was named Pro Ambitions Rookie of the Week on Nov. 12 for after a four-point weekend in conference play. Madden was named to the USHL All-Rookie Second Team in 2018 while skating with the Tri-City Storm and was named Team East MVP at the USHL/NHL Top Prospects Game. O'Brien, a rookie forward, has competed in nine contests for the Friar s to date and recorded his first career goal against New Hampshire on Dec. 1, which proved to be the game winner. The 19th overall pick of the 2018 NHL Entry Draft, O'Brien was selected by the Philadelphia Flyers. O'Brien was named the USA Hockey Junior Player of the Year and the Boston Bruins' John Carlton Memorial Award win ner in 2018 after posting 43 goals and 37 assists in 30 games at Thayer Academy in 2017-18. Primeau, a sophomore goaltender, was selected in the seventh round of the 2017 NHL Entry Draft by the Montreal Canadiens. The Northeastern goaltender currently has nine wins through 13 games and was named Stop it Goaltending Goaltender of the Month for his efforts in October. As a freshman, Primeau was named to the All-Hockey East First Team, Pro Ambitions All-Rookie Team, and was named New England Hockey Writers Co-Rookie of the Year as well as a spot on the New England Hockey Writers' All-Star team. Wahlstrom, 11th overall selection in the first round of the 2018 NHL Entry Draft by the New York Islanders, has recorded four points (1g, 3a) through his first 12 contests with the Eagles. The forward was awarded Pro Ambitions Rookie of the Week honors on Oct. 9. Wahlstrom won silver at the 2018 IIHF Under-18 World Championship and gold at the 2017 IIHF Under-18 World Championship with Team US A.
Crotty has appeared in 13 games for the Terriers in his sophomore season, registering nineteen shots on goal. In 47 career outings, he has posted one goal and seven assists. He was selected by the Arizona Coyotes 82nd overall in the third round of the 2017 NHL Entry Draft. Bowers has posted five points on three goals and two assists through th e first 13 games of his sophomore campaign. He's enjoyed a two-goal outing on Nov. 11 in a 3-2 win a gainst New Hampshire, including the winning strike in overtime. He is a 2017 first round selection of the Colorado Avalanche, chosen 28th overall. Kondelik has dished out a Hockey East-best 12 assists in 15 games this season for the UConn Huskies in addition to leading his team with 13 points as a freshman. Kondelik was picked 111th overall in the fourth round by the Nashville Predators in the 2018 NHL Entry Draft. Lindberg has helped Massachusetts to the best start in program history, carrying a 3-1-0 record for the Minutemen in four games started. He has stopped 102 of the 109 shots he's faced in 242:09 of work, good for a 1.73 goals against average and .936 save percentage.